Group Affiliation: Freedom Force, former servant of Shadow. Thanks to Energy X, John Miller has what he believes to be the proportionate strength, etc, of an ant. Though not quite as strong, overall, as Minuteman, he is still remarkably strong, and extremely durable. And he can lift and carry heavier loads than even his overall strength would suggest. He can climb walls thanks to small claw-like pads on the inside of his fingertips and feet. His exceptional metabolism grants him an increased resistance to acid, radiation, and other toxins. He also can dig through most earthen materials at a rapid rate. Miller is also capable of communicating with ants. Under normal circumstances, the most he can do is summon a swarm of flying ants to blind an opponent by covering their face. But he has on occasion run into one of the giant ants provided to him originally by Shadow. These would promptly join up with him and fight alongside him. By effectively “shouting” in the ultrasonic frequencies he uses to communicate with the insects, he can cause a significant neural feedback in anyone within a certain distance from him. He is also an exceptional scientist and engineer, with a paricular fondness for insects. To assist him in combat, he carries grenades filled with the acid from the giant ants from Shadow. John Miller was a High School Senior enjoying himself by studying an anthill when he was accosted by the local bullies, “Rex” and the Gang (not to be confused with Kool and the Gang). Laying spread-eagled on the ground and somewhat dazed, he could not move in time when he saw, to his shock, a beam of energy headed right for him. Amazingly, this energy granted him superhuman powers. 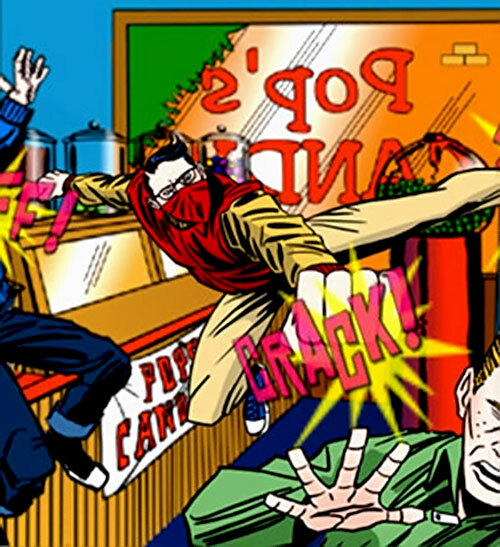 Powers he promptly used to protect the kindly old man who ran the local candy store when Rex and the Gang decided to accost him. At some point he encountered the super-villainess named The Shadow, and fell under her hypnotic sway. She supplied him with either the means to create giant ants, or the giant ants themselves. Shadow had him use his ability to speak with them to convince them to help her steal things from the surface world. This eventually included entire neighborhoods. When Freedom Force investigated, she ordered him to kill them. This was so against his personal code that he was able to break free, and helped them defeat her. 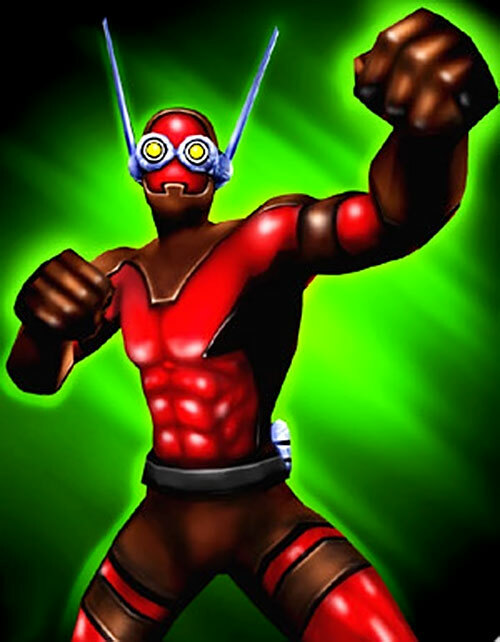 Ever since, The Ant has been a trusted member of Freedom Force. His scientific ability, backing up Mentor’s own knowledge, has proven as invaluable as his physical prowess. In his secret ID, John Miller is a slightly short young man of average build, wearing glasses and (usually) a v-necked sleeveless sweater over a white collared shirt and brown trousers. 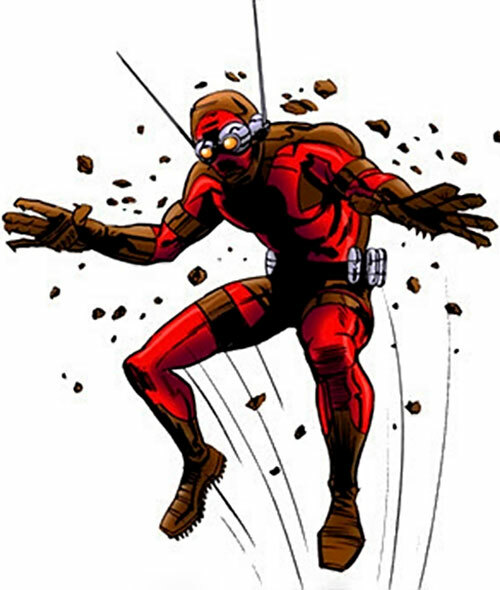 As the Ant, he wears a red and brown bodysuit with a stylized ant pattern, as well as goggles with decorative antennae on them. Eager and willing to do what it takes both to help his team, and make them like him, the Ant’s geekiness is still just as strong as ever. He’s quite light-hearted in combat, though not as skilled at the verbal quips as the character he’s obviously patterned after. Sonic Beam has No Range, and Area Effect (-0 total). Flash represents a swarm of ants summoned into the eyes of the target. Speak With Animals only affects Ants (-1). Systemic Antidote also adds to RV vs acids as well as toxins, etc. (+1). Gravity Decrease has no range (-1), and cannot reduce the weight of an object below 0 APs (-0). Expansive HQ (The Freedom Fortress), Familiarity (Entomology). 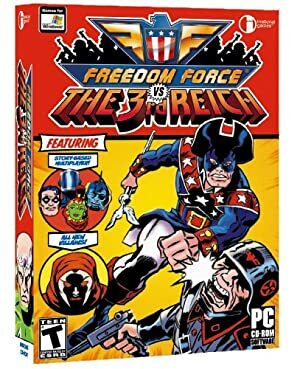 Freedom Force (High). It is possible he may still have a Low connection to Shadow, if she survived. Acid Bombs (x10) [BODY 05, Acid (No Range, Area of Effect 1 AP): 07. Grenade Drawback].